Stage 1: Breaking the News. This is the third part in a multi-part blog series about leaving the congregation I served. After a lengthy planning process with my Director of Religious Exploration and Music Director, my first step was to send a message to the Board President suggesting we meet after worship on a Sunday in July when I wasn’t set to preach. We had several things we needed to catch up on, and my plan was to tell her as a part of that. a draft letter from the Board that the president could edit as she would like. Here is the final version. And one week later, Sunday, I would deliver a homily at a service that our Music Director (who knew what was coming) was leading. Not surprisingly, the reactions spanned the gamut. Some people were shocked. Others were not at all surprised – some were almost fatalistic about it. Some people were angry. Some were just sad. Some were confused. One thing that was particularly interesting to me is that people didn’t stay where I thought they would: someone might start out not very surprised, and then quickly move to angry. Someone else might start out sad, and then move to confused. On Tuesday, the Board swiftly moved into problem-solving mode: What was next for the congregation? I was glad that the ministry team and I had come up with one possibility to use as a starting point for the discussion. Though I was not in on the planning in future meetings, I did walk with the Board in this first meeting by talking about the transition process and what might be next for them. I was very surprised by one mistaken calculation I had made. I had thought that the newer people in the congregation would be the ones who were most upset: I was the only minister many of them had ever had. I thought that the longer term members, who had been through this before, would be less anxious. In fact, the reverse was true. Newer members on the Board (and within the larger congregation) who had not been through this process were the most hopeful. Members who had been through this process once, or twice, or even more, were very, very nervous. Would they be able to find a good interim? Would they be able to find a settled minister? After living through a negotiated resignation and a failed search prior to calling me, they did not want to go through that pain and struggle again. One of the stories that I would repeat over and over again in the coming weeks was that we had done excellent ministry together and so they were a more desirable congregation than they had been a decade earlier. I hope that these assurances turn out to be true. For me, and I am sure for most of the leadership, this was an exhausting week. Calling leaders out of the blue to set up coffee dates with them alerted them that something was up. They were all so full of love and hope for me. I was surprised that our conversations often triggered old feelings around disappointing my parents. And at the same time, the conversations confirmed what I knew to be true: it was time for me to leave, not just for me but for the congregation. My gifts and their needs no longer matched up. By the time the next Sunday rolled around, most people were aware of what was happening. In my homily, I talked about the mutuality of the relationship – how we had been an excellent match for seven years, and how much I loved them. While there were tears (I tend to cry in the pulpit pretty frequently) there were not as many as I was afraid there would be. After having had the sword of Damocles dangling for a while, I thought that this stage of breaking the news would be the most difficult and that things would get easier from there. While I was indeed relieved, in many ways this stage was just the beginning of a lengthy and emotional process. **I thought being available to do memorial services until such time as the congregation had an interim minister would be okay for me and for the congregation. This was a mistake, as I realized when I was called to lead a service and found it was not in my own best interest to return in that capacity, nor was it in the best interest of the congregation. If I were to do any one thing differently about my leaving process, I would take that FAQ question out entirely. This is the second part in a multi-part blog series about leaving the congregation I served. As many colleagues have told me, most ministers leave either a year too early or a year too late. I have no idea where I fall, but I aimed for a year too early. Just over a year ago, my family hit a crisis that took much of my emotional energy. The congregation I served held me in care and love and gave me the time and space I needed to attend to the crisis. When something like this had happened before, I had returned to the congregation with renewed commitment and appreciation, ready to serve. But this time it felt different. I realized I wasn’t happy, but I attributed my discontent to being drained from the family crisis – I thought I just needed time to heal. I wanted to want to stay. After the winter holidays last year, I thought I had internally recommitted to the congregation. I led a worship service where the congregation and I recited the promises we had made to each other during my installation. I shared that I looked forward to 7 more years together and wondered aloud what they might bring. At the same time, I was finding the day-to-day of ministry no longer as satisfying as it had been. Even though leading worship is one of my favorite privileges of this vocation, it became more and more difficult to write sermons each week. I enrolled in graduate school, hoping it would engage me in new ways. I traveled more than previously because I had said “yes” to many commitments outside the congregation. In hindsight, I realize I was looking for reasons to get away from the congregation – reasons not to preach, not to engage. There was no major conflict – no single event that precipitated my decision. To this day, I dearly love the people and institution of the congregation I served. But parish ministry was no longer working for me. I looked at what the congregation and I needed to work on in the coming years and found myself lacking enthusiasm. I began to realize that I was ready for a new challenge and the congregation needed a different type of leader to take it into the coming years. It was time for me to move on. I decided to look around, not really expecting any positions would be open since the timing was wrong. But then I found something that I realized I was excited about, that would combine the degree program I was enthusiastically beginning, the ministry I was doing, and service to our larger faith tradition. I pursued it, went through the application process. I was terribly excited when I was offered and accepted the position. But I was on summer vacation! How was that going to work? While I did not feel I could share my process (at that point) with the lay leaders of the congregation, I did share what I was doing with my ministry team (Director of Religious Exploration and Music Director). We had always worked as a team, and I felt they needed to know. It is telling, perhaps, that those who worked closest to me, who I shared my ministry with and relied upon, were not surprised at this news. They had seen the telltale signs even better than I had. And so together, we began to brainstorm what the congregation would need to know/hear as well as what some of the possibilities were for the congregation since I would be leaving off the regular ministry cycle. I spent my “vacation” working on a plan for who to tell, how, when, and what. For a few weeks, I felt the sword of Damocles hanging not over my head, but over the heads of the beloveds in the congregation I served. I knew this would take most of them by surprise. When it was time to pull the trigger on my plan, I thought I was ready. And logistically and rationally, perhaps, I was. But I was not emotionally prepared, even with all the reading I had done. 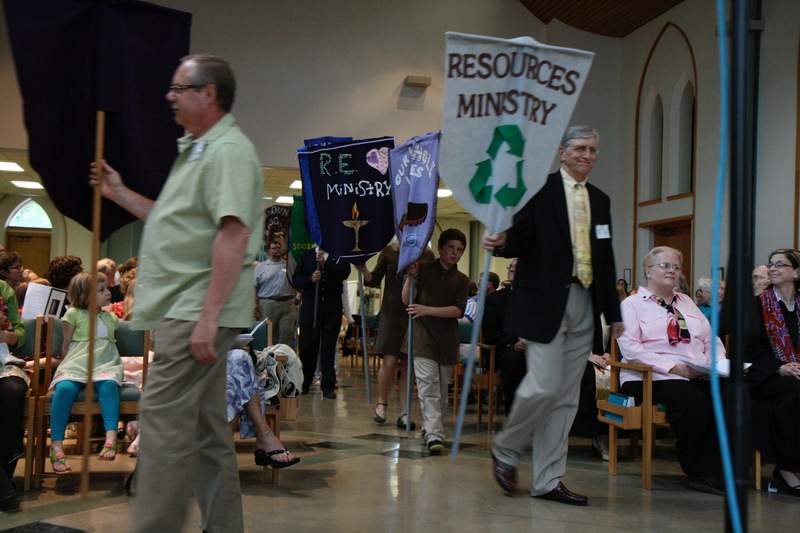 As the ministerial search season kicks off for Unitarian Universalist ministers, I thought I would share my recent experience of leaving the congregation I served for seven years. Leaving is difficult, and I am proud of how the congregation and I navigated the process together. A little background. The congregation I served had gone through a negotiated resignation after four years with their previous settled minister. Then had a “failed search” – so three years of interim ministry. Prior to that, their previous two ministers had both had tenures of more than 10 years. It was with this history in mind that I determined that my final ministry to the congregation would be for me to leave well. I have often heard that ministers tend to leave either a year too late, or a year too soon – I wanted to hit it just right. Towards these ends, I read the required texts: Running Through the Thistles and Mark Morrison Reed’s Berry Street Lecture After Running Through the Thistles the Hard Part Begins. I talked to the Transitions office of the UUA, and to my regional staff. My story is different than most in that I did not take a position with another congregation. Also, I did not move out of town and my family continues to attend the congregation I used to serve (something that the congregation has a history with so is not quite as strange as it may sound). But while there are aspects to my leaving process that may be unique, there was much I learned from talking to colleagues who had recently left congregations that they served. This blog series is an attempt to formally share my experience. It contains both personal reflections, as well as some logistics on how I did things. I have found it helpful to utilize the structure provided by Jane Jordan-Meier, in her book The Four Stages of Highly Effective Crisis Management, outlined below, with an added “Stage 0” for the discernment process and an epilogue. Each link below will take you to a separate blog containing reflections and resources. All that said, this is my experience and yours will undoubtedly be different. But sometimes it is nice to have a place to start. I hope this is helpful. Please feel free to take any/all of this material and edit it to suit your needs. A minister leaving a congregation precipitates a crisis for the congregation. But before I even announced that I was leaving, I had to decide that it was time. This stage details how I shared the news of my departure with the congregation and their initial reaction. After breaking the news, the focus quickly moved from the initial shock to wondering how this could have happened. I was determined to avoid finger-pointing (either my own, or from the congregation.) Jordan-Meier suggests it is best to skip this stage if possible, but I think that intentionally managing it was more effective in my case. As the congregants and I came to terms with my departure, we were able to move into a new way of being together – one characterized by a lot of joyful tears, hugs, and celebrating what we had achieved together. I thought the leaving process was done on my last Sunday, but I was wrong. If you are leaving a congregation you have served, I hope you find my experience moderately useful. Leaving a congregation is hard work. It is emotionally draining, whether you are leaving on good terms or not. Take care of yourself, approach the task with intention, and know that you are not alone.